There Will Be Blood is an adaptation of Oil! 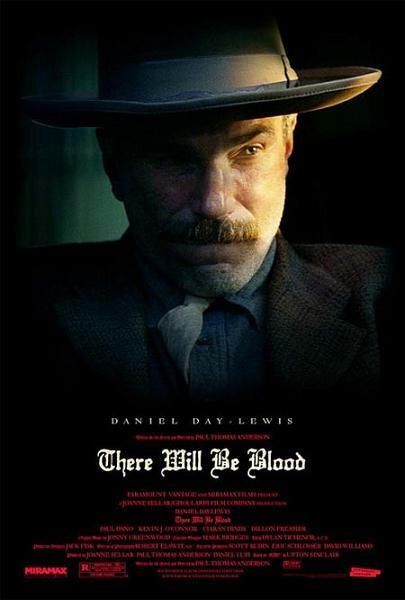 by Upton Sinclair and stars Daniel Day-Lewis as a self-made oil man, Daniel Plainview, circa 1900. Director Paul Thomas Anderson (who also wrote the screenplay) captures the broad scope of the beginnings of big oil as well as the more intricate details of one man's life as he embarks on a journey of unfettered capitalism. The film doesn't progress as much as it unfolds, like a map of the human soul, showing us just what it takes for Man to conquer nature: indomitable will, opportunism of such an order that it would make Sun Tzu blush, and a wolfish desire to devour any and all comers who would take even the smallest morsel of what you have horded. Day-Lewis's turn as the implacable Daniel Plainview is nothing short of genius. He's one of those actors who can disappear into a role. You might ask, "Well, isn't that the point of being an actor - to disappear into your role?" Yes and no. When Paul Newman does a show, in whatever role, you might as well try to blot out the sun than cover up his signature charisma; Betty Davis' supercilious bitchiness was a hallmark of her roles, which gave her the unenviable reputation around town as being "difficult" despite being one of the most professional actresses to ever grace the silver screen; and let's not forget Marlon Brando's unforgettable broodiness - that man, in his prime, could kill you with one smoldering look. All of those actors were, without a doubt, true-blue actors but each of them had a "tell". Day-Lewis simply vanishes into his characters. Rent Gangs of New York and tell me he isn't The Butcher, body and soul. "Who's this Daniel Day-Lewis guy?" you'll ask. "He doesn't exist. Man, even the name sounds fake." The running theme is about a man's legacy. What does he build with his own two hands? Is it lasting? Does it even matter? Are his sons worthy of his legacy? The film begs these questions by giving Plainview the son of his making and choosing, and the son that nature (or God) intended - his two legacies, if you will. There's a revealing scene where Plainview asks his brother, Henry, "Are you envious? I have a competition in me. I want no one else to succeed... If it's in me, it's in you," as if this trait and this trait alone makes them somehow "family". His particular brand of anti-socialism is only matched by one Eli Sunday (played by Paul Dano), a local preacher-boy who exhibits a certain kind of wolfish opportunism in leading his flock to the Promised Land. Plainview instantly recognizes an adversary and with equal alacrity learns to hate him. You get the sense that Plainview despises people, generally, but despises himself most of all because he sees whatever is in himself in Eli - the son that should have been. There's some amazing photography going on here and Anderson takes advantage of most of it. He's not what you'd call a visual storyteller. He's more of an actor's director - which is fine, because he has our generation's most versatile leading actor to work with. The original score by Jonny Greenwood (of Radiohead fame) leaves something to be desired, however. When a movie score draws attention to itself without meaning to, you're in trouble. Remember how John Williams created the shark in your mind's eye whenever the theme to Jaws slowly creeped from the speakers? Yeah, this is nowhere near that good. Don't get me wrong; the music itself is fine. It just fails to seamlessly meld with the visuals that are juxtaposed to it. Still, Daniel Day-Lewis carries the day (yes, pun fully intended). Rank A.